Has anyone used these springs on their H1? I want to level it out and thinking these spring should get me close to where I want to be. 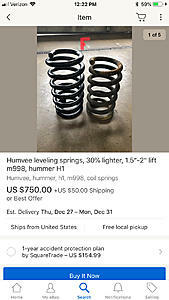 Sorry, I meant coil springs ? These state that they will lift the front of a Humvee by 1.5-2"s but the h1s won't get as much lift due to the extra weight. According to the listing. Thanks. I emailed rubber duck and they told me those springs would lift the front end too much. He recommended the snow plow springs and said it should level it out.